Home (JO)KERS in Comedy of Errors! (JO)KERS in Comedy of Errors! The title of the Shakespearean comedy, ‘Much Ado About Nothing’ would have been an apt description for last week’s ‘Janabalaya Colombata’ (literally, Peoples’ Power to Colombo) protest launched by the Joint Opposition (JO) and its allied political party, the Sri Lanka Podujana Peramuna (SLPP), better known as the ‘pohottuwa’ party. 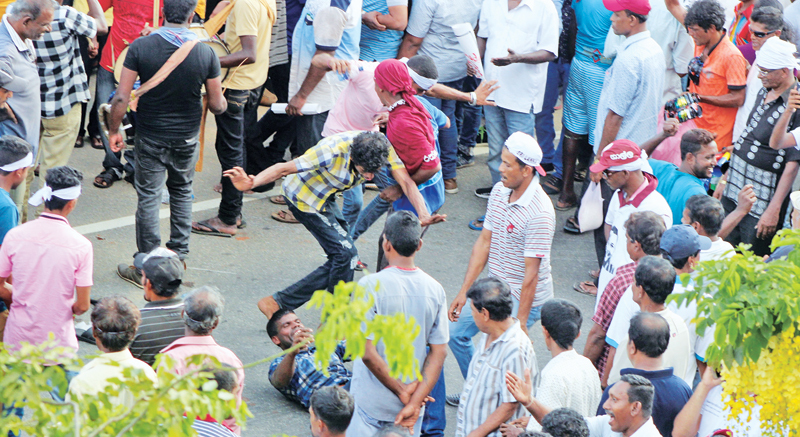 The protest campaign was touted by the JO as having the potential to bring down the government and claims were made that the President’s House in Fort and Temple Trees, the Prime Minister’s official residence in Kollupitiya would be under siege. The JO’s plans were also shrouded in secrecy, with even party organisers being told that details of venues would be made known only at the eleventh hour. In the end such strategies turned out to be ineffective and even JO insiders acknowledged that the protest was a flop as it did not evoke a wave of public support for the party. More importantly, there were several negative aspects in the campaign that highlighted the fact that the JO’s popularity noted in the local government elections in February, might now be on the wane. In the lead up to the protest, the JO accused the government of trying to sabotage it. Of particular concern was the difficulty of obtaining buses to transport protesters to Colombo. The Police also attempted to prevent the protesters from entering areas considered ‘high security zones’ and made applications to this effect but three courts refused these applications. Finance Minister Mangala Samaraweera, who has kept a low profile in recent times, added some ammunition to the verbal salvos being fired prior to the campaign, stating that protesters should be dealt with severely, if there was a risk that public property could be damaged. It was a clear signal that the government was watching developments earnestly. For his part, President Maithripala Sirisena chose not to comment on the JO’s campaign. Some interpreted this as meaning that he was opting to keep his options open vis-à-vis a reconciliation with the Rajapaksa faction of the Sri Lanka Freedom Party (SLFP). On the other hand, Prime Minister Ranil Wickremesinghe, with characteristic humour, chose to showcase the protest as a depiction of the government allowing democratic dissent. Thus, the protest was being billed as a showdown between the government and the JO and more importantly a political battle of wits. The protest campaign has several objectives. The JO wanted to test the strength of public opinion against the government and channel those sentiments to its advantage. It was also supposed to be a political debut of sorts for Gotabhaya Rajapaksa, its potential presidential candidate in 2020. Finally, this was also the first major opposition campaign spearheaded by the heir apparent in the Rajapaksa political dynasty, Namal Rajapaksa. That there was public sentiment against the government was no secret. The burdens of incumbency- skyrocketing prices of essential items, a wave of crippling strikes and failing to meet lofty expectations- ensured that the JO was ideally placed to exploit them. However, they didn’t or couldn’t and that should be a matter of grave concern for the opposition grouping. There were several reasons for this. First and foremost, the turnout was far below expectations. Whether this was because the arrangements were shrouded in secrecy or whether it was because the JO was fast losing its appeal is now being hotly debated in the party. It is likely that it was a combination of the two factors. Secondly, the protest lacked a definite agenda. While the advance publicity was about surrounding President’s House and Temple Trees and parliamentarian Pavithra Wanniarachchi’s ridiculous claim that the government will fall overnight, the campaign fizzled out as there was no central event such as a political rally which was the high point of the protest. In the end, what transpired was a comedy of errors. At the start of the day, when media men asked former President Mahinda Rajapaksa what the plans for the protest were, he categorically stated that it would go on till dawn. To give the older Rajapaksa his due, he appeared optimistic and gave it his all, despite his advancing years. However, by midnight most protesters had left the Lake House roundabout, which had become the focal point of the protest and the JO had to make do with a candle light vigil which too had to be called off before long. Parliamentarian Namal Rajapaksa was quizzed by the media about this- and his previous promise that the protest would be a dusk to dawn affair and he responded stating that the campaign had gone beyond midnight and was therefore a ‘dusk to dawn’ event. When politicians resort to such semantics, it is an indication that all is not well. In contrast to a political rally- which had been the modus operandi of the JO in the past and which had earned them great success- ‘Janabalaya Colombata’ was also reduced to JO leaders- including Mahinda Rajapaksa- making short impromptu speeches from a mobile microphone. While Rajapaksa gave it his best shot, accusing the government of intimidation, it was a far cry from the racy rhetoric that usually emanates from JO platforms. The other item on the JO’s agenda, the political debut of Gotabhaya Rajapaksa, also had mixed results at best. The party faithful did cheer him and some shouted slogans hailing him as the future President but his appearance was brief and the former Defence Secretary did nothing to hint that he could match brother Mahinda for political charisma or public appeal. With the campaign fizzling out, even party stalwarts were asking the obvious question: where was Basil Rajapaksa? The younger Rajapaksa was in fact in the United States and was conspicuous by his absence. Whether that was because he did not endorse the protest or the manner in which it was carried out or whether it was because he had other matters to attend to, is a question that is being asked in JO circles now. In that sense, ‘Janabalaya Colombata’ did highlight Namal Rajapaksa’s inexperience as a political campaigner. Basil Rajapaksa has many faults and his public relations skills are not the best which is why he is not the most popular politician even within the ranks of the JO but no one doubts his ability as a political organiser. If anything, this campaign appears to have demonstrated that without Basil Rajapaksa, the JO would not be a force to reckon with. Politics is a game where timing is everything. Mahinda Rajapaksa has previously used popular protests such as the ‘Paada Yatra’, a march from Kataragama to Colombo, against the government of Ranasinghe Premadasa to good effect. Two years ago, a similar march from Kandy to Colombo was also a reasonable success because it demonstrated the JO had public support and convinced many parliamentarians who were with President Sirisena to switch allegiances. The ‘Janabalaya Colombata’ however was too little, too soon. It was ill-timed. It did not offer the public any tangible answers except being yet another opposition protest that was full of hype and severely inconvenienced the public, most of whom were allowed to return home early on that day by their employers who feared clashes and disruption of transport services. With the benefit of hindsight, the JO would have been better off launching ‘Janabalaya Colombata’ closer to the next presidential election, when its impact would be fresh in the minds of the public. Now, it would be foolhardy to stage another campaign and the JO has lost that opportunity. On the other hand, the government has not only survived the protest, it can also claim that it allowed dissent while maintaining law and order and avoiding serious incidents. The brains behind the JO must be back to the drawing boards now, asking themselves what went wrong with ‘Janabalaya Colombata’. They must be hoping that the advantage they conceded to the government, particularly its United National Party faction, would not be irreversible.